From the author of The Five People You Meet in Heaven and Tuesdays with Morrie, a new novel that millions of fans have been waiting for. "Every family is a ghost story . . ." Mitch Albom mesmerized readers around the world with his number one New York Times bestsellers, The Five People You Meet in Heaven and Tuesdays with Morrie. Now he returns with a beautiful, haunting novel about the family we love and the chances we miss. For One More Day is the story of a mother and a son, and a relationship that covers a lifetime and beyond. It explores the question: What would you do if you could spend one more day with a lost loved one? As a child, Charley "Chick" Benetto was told by his father, "You can be a mama's boy or a daddy's boy, but you can't be both." So he chooses his father, only to see the man disappear when Charley is on the verge of adolescence. Decades later, Charley is a broken man. His life has been crumbled by alcohol and regret. He loses his job. He leaves his family. He hits bottom after discovering his only daughter has shut him out of her wedding. And he decides to take his own life. He makes a midnight ride to his small hometown, with plans to do himself in. But upon failing even to do that, he staggers back to his old house, only to make an astonishing discovery. His mother--who died eight years earlier--is still living there, and welcomes him home as if nothing ever happened. What follows is the one "ordinary" day so many of us yearn for, a chance to make good with a lost parent, to explain the family secrets, and to seek forgiveness. Somewhere between this life and the next, Charley learns the astonishing things he never knew about his mother and her sacrifices. And he tries, with her tender guidance, to put the crumbled pieces of his life back together. Through Albom's inspiring characters and masterful storytelling, readers will newly appreciate those whom they love--and may have thought they'd lost--in their own lives. 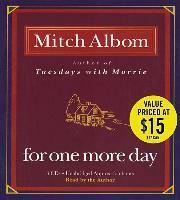 For One More Day is a book for anyone in a family, and will be cherished by Albom's millions of fans worldwide. Mitch Albom is an author, playwright, and screenwriter who has written seven books, including the international bestseller Tuesdays with Morrie, the bestselling memoir of all time. His first novel, The Five People You Meet in Heaven, was an instant number-one New York Times bestseller that has since sold more than six million copies worldwide. Both books were made into acclaimed TV films. Mitch also works as a columnist and a broadcaster, and serves on numerous charitable boards. He lives with his wife, Janine, in Michigan.